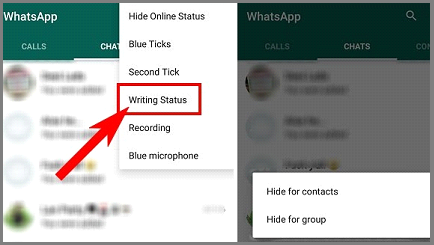 How to Hide Online Status on WhatsApp Chat? Do you want to appear online without showing your actual status on WhatsApp? It is possible that you need to hide online status on WhatsApp or need to trap someone by reading and replying to their messages without demonstrating blue tick on their sent messages, this article will enable you to do that. Although, Whatsapp is having settings like turning off read receipt and hiding profile pictures. But, the app does not allow users to send messages without showing the online stamp on chat. However, there are few apps and tricks which might be helpful to appear yourself offline on WhatsApp while chatting. There are some ways by which you can show yourself disconnected in WhatsApp regardless of whether you are on the web. If you can relate to me and are looking for ways on how to change your online status, and yet do not miss any important text then you are at the right place. You may be already aware of some of these hacks yet adding some more can help you better. Putting on the Airplane mode is simply the most ideal approach to escape from the web, it's more like banging the doors on the faces of any such disturbance. You may not get the notification simultaneously while showing offline, will get them all once you put this mode off. The pending received messages on your WhatsApp can be read after you go offline by the flight mode. Step 2: Open the Wireless and network option. Note: You can miss any important message while keeping your smartphone in Airplane mode, as it turns off the whole network of your phone. No calls, no text. If you are in a very bad mood and do not want to any particular contact in your phone to outreach you, then you can always block this particular contact. It will certainly stop them from sending you any text. But, this is the method you should not practice regularly as it is meant for the most extremist situation. Well, this is one of the most common ways to hide from your WhatsApp contact while still getting all the text and notification. So, hello Sherlock you have a great way to keep an eye on what people send you. This does only create an illusion of yourself by not showing people when was the last time you were active. It does not stop any notification but can reduce them to some extent. Step 2: Tap on Account. Step 3: Tap on Privacy. Step 3: Tap on Last Seen. Step 4: Set it to nobody. We have recently been introduced with the ticks and colour variation in the ticks when you send a text to someone. One tick for the sent message, double for delivered and the ticks turn blue when they are read. But you can still hide, by turning off the read recipient in the privacy setting of your WhatsApp. Step 4: Turn off the “Read receipts” option. Previously we could only enjoy the hiding status feature by we can not remove the Display Picture as well. We often check the status and DP of a WhatsApp contact which gives us an idea of their activity. Wherefore, if you remove the display picture you can easily create an illusion that you are away and do not what to receive any text or notification. Step 4: Select the Profile picture option and tap on No body. Go to WhatsApp Settings > Chat Settings/ Privacy > Advanced. Turn off the Last Seen Timestamp option, and select Nobody. 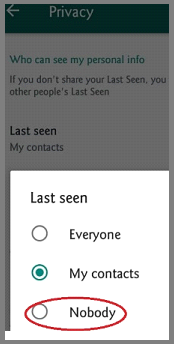 This is more like turning off the Last seen and still, you are able to chat and exchange words. However, this also helps you achieving an escape and at the same time working on the application. Note: You can also reverse the same by turning on the last seen Timestamps option. Although WhatsApp provides you with an option where nobody gets to see your Last Seen but still when you are online, the status is reflected under your name. ‘Hide for WhatsApp’ is an application which allows to use WhatsApp, read or reply, without showing that you are online. This app actually uses Google Now to send messages so you get to read and reply to messages without being online. Step 1: Install the application. 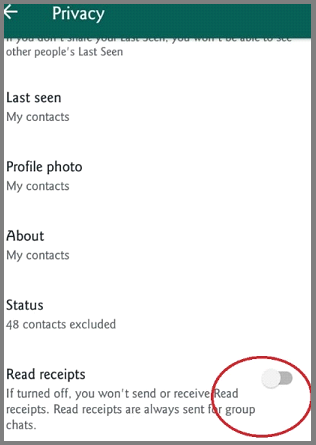 Step 2: Accept the ‘Read Notification’ and ‘Read Contacts’ permissions. Step 3: read and reply to all your WhatsApp messages through this app. Using the app will be the same as WhatsApp. Instead of ticks, you will find a clock icon. Now, turn on your Internet connection. As soon as you turn it on, your message will be sent and no one can see you “typing”. Try installing it. Once you install this app go to the Settings option> Privacy > Tap on Writing Status and there you go, you can hide Typing stamp for WhatsApp in your iPhone. Techniquehow.Com: How to Hide Online Status on WhatsApp Chat?